How to Make a Light Up Sign with LED Lights! My husbands man cave has been needing a nice backlit sign for a good while now. In an effort to avoid the typical bar room neon look, I decided to build him a custom sign with full color LED strips that are fully adjustable on a color wheel, directly from his cell phone. We agreed on “The Dubya” for the text on the sign. Our last name is “Wilkerson” and some of my husband’s friends call him by the nickname “Dubya”. So when the subject of picking the text of the sign came up, we pretty well knew which way we would go. 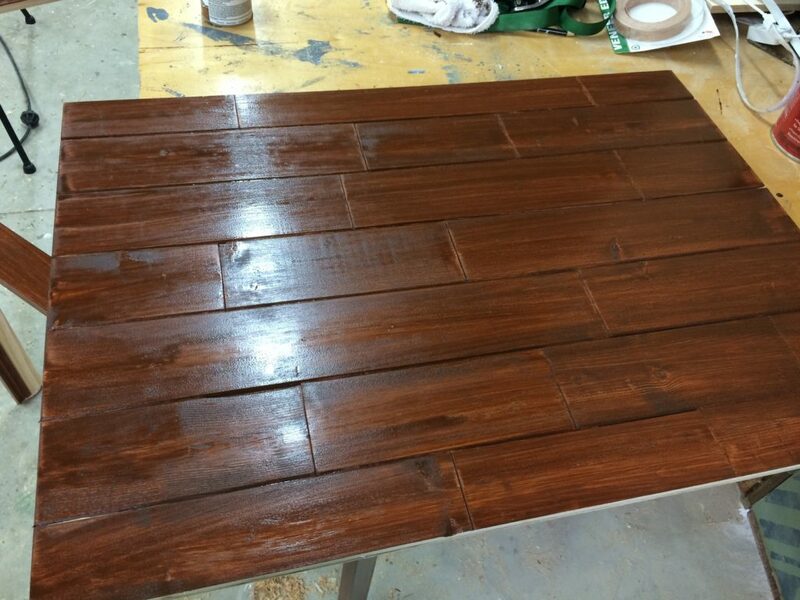 This is a great scrap wood project. I was able to complete this build using only wood left over from previous projects. To make the stencil, I went to a local FedEx with a text file on a thumb drive and had them print off my sign. Mine says “The Dubya” but of course yours could say or be anything. I had it printed off at the size I wanted my sign, brought it home, and then taped it down to my dining room table. I used boxing tape to tape over the lettering which gives it some rigidity whenever you are using it as an actual stencil. Using an X-Acto knife, I cut out all of the lettering, making sure not to lose the inside pieces of the letters because they will be needed later. Make sure you place a board underneath the printout before cutting so you do not scratch your tabletop! I purchased my piece of plexiglass from the big-box store and chose a size that was slightly larger than the size I needed so that I could cut it to the exact size I wanted it. To cut the Plexiglas I used my table saw, making sure to use painters tape on the cutline to reduce the tear-out on the backside as best as possible. Note: It is way cheaper to order the plexiglass offline! 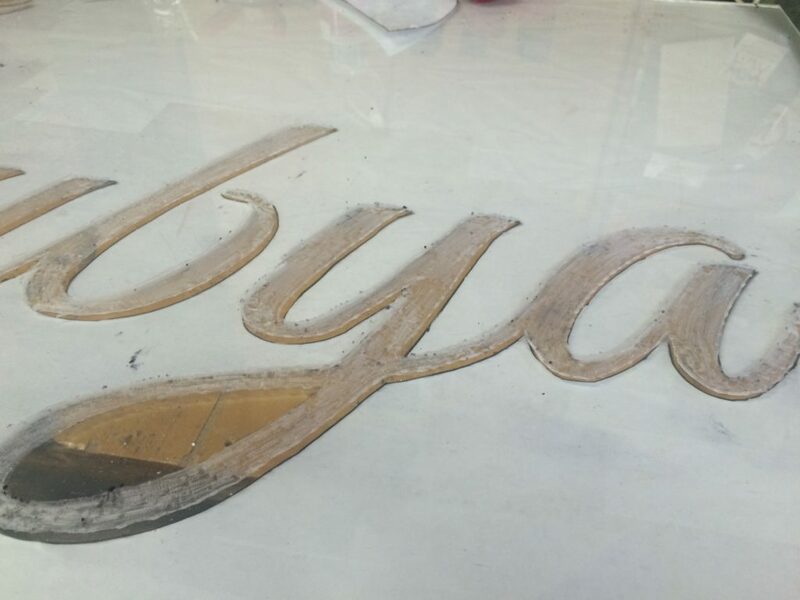 I then placed the stencil on the top of my plexiglass and used a sharpie to trace out the lettering. Then I went through with my Dremel tool and started etching the stenciled area. However, if I were redoing this project I would actually change up this part just a bit. By etching on the front surface you can touch the etched lettering at the end of the project. So instead I recommend tracing the lettering on the front but then flipping the plexiglass over and etching on the back. If you do this, be sure to laydown a towel before laying the plexiglass down so that you don’t scratch the surface. 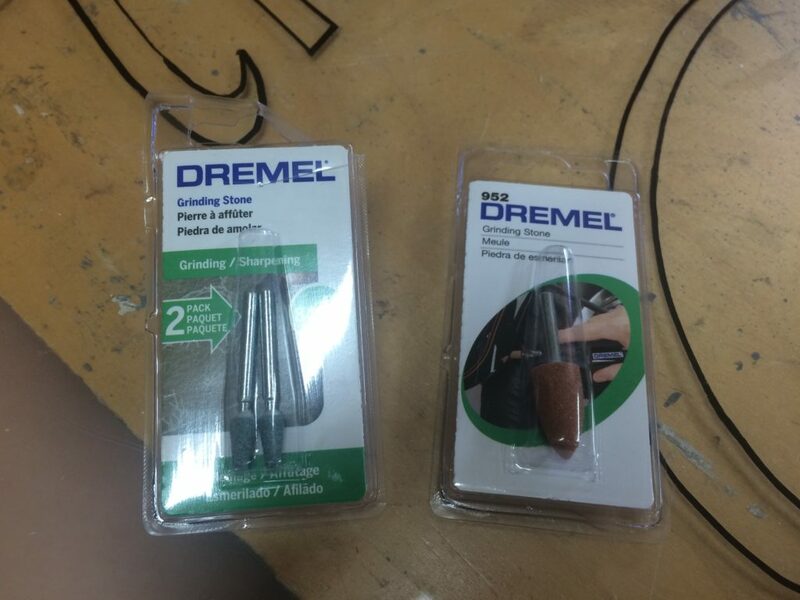 For etching, I’m using a “Dremel” tool made by craftsman however you can find a cheap tool at any hobby store or big box store. I first used a small fine bit to outline the letters then came back with a larger bit to fill them in (both bits are linked above). You’re not going for a lot of depth here, you just need a nice clean etched surface. After getting all of the etching done I used sandpaper to smooth it to the touch. I wanted a random pattern for the back so I first dry fitted the pattern to make sure I was going to be happy with it before permanently placing them. I played around with the placement of all the pieces until I was satisfied with their arrangement. I laid down glue and then started attaching them permanently. 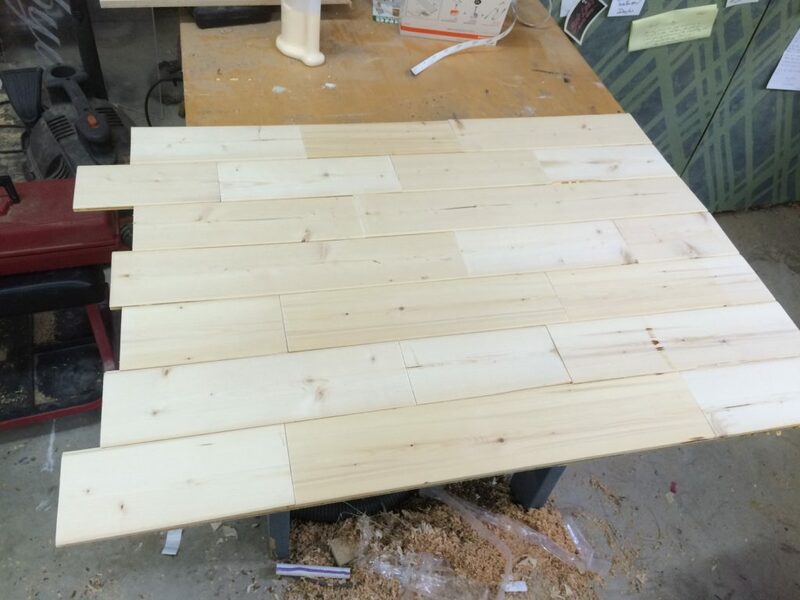 I would lineup the pieces with the right edge and let it overhang on the left edge. Then I added some weight and let it dry. While that was drying I looked around my shop to see what I had on hand to start making the frame. I found a couple of suitable pieces on the lumber rack, cut them to length, and then moved to the table saw to cut in some dados. I made a dado on the front of the frame for the LED strips and the plexiglass to go into and then cut a rabbit on the back for the back to rest in. To make this go quicker I exchanged my table saw blade for my dado stack. 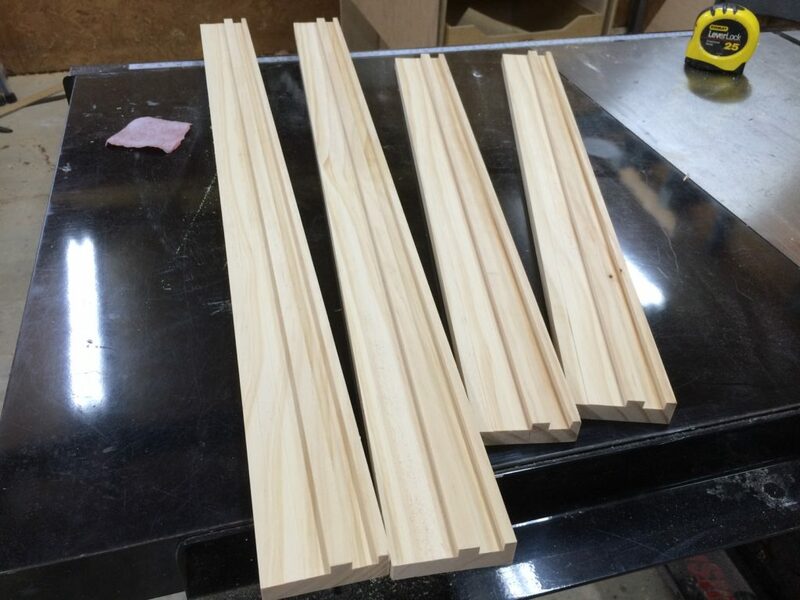 However if you do not own a dado stack, just make multiple passes with your table saw blade. Next I turn my blade 45° and cut a miter on all of the edges of the frame pieces. Miter joints are not very strong so to reinforce these joints I am using a biscuit joiner to cut a biscuit slot on each mitered edge. If you do not have a biscuit joiner then a good alternative is a pocket hole jig. I turn my biscuit joiner to 135° and used a 0 biscuit. I started gluing up the frame, however instead of gluing all four pieces together right now I’m only gluing the two side pieces to the bottom. I need the top left off so that I can later slide in the plexiglass material. But to make gluing up the three pieces easier I am going to dry fit the top piece into place. I applied glue to the bottom of the two side pieces and attached it to the bottom piece. I used my four right angle clamp jigs, as well as a ratchet strap to glue these together and then let it sit overnight. By this time the back was dry and ready to cut to size. I use my track saw to cut the overhang flush to the edges, completing the back. After letting the frame sit overnight I tested the plexiglass in the dado to make sure I was not going to have any problems with the fit. It turns out the plexiglass was still a little too tall for the frame to fit together completely, so I slowly took off a little material at a time with my table saw until the fit was nice and snug. Once satisfied with the fit of the plexiglass, I removed it from the frame, set it aside, and gave the entire frame a coat of stain and two coats of water-based poly. With the back and the frame dry, I glued and nailed the back into the rabbit I had cut earlier. Now I can start putting in the lights. I am using some LED flexible lights so all I have to do is peel off the paper backing and stick them where I want them. I first dry fit the lights in the dado slot to make sure I was going to have enough clearance. Once satisfied, I took off the paperback and started sticking them permanently. Making sure that they were seated all the way into the dado slot. With the lights in place I slipped in the plexiglass sign and put the top of the frame on. At this point I added glue to the biscuits on the top of the frame peace and clamped them in place and let them dry. I let the glue dry for two hours, came back, and plugged in the lights. 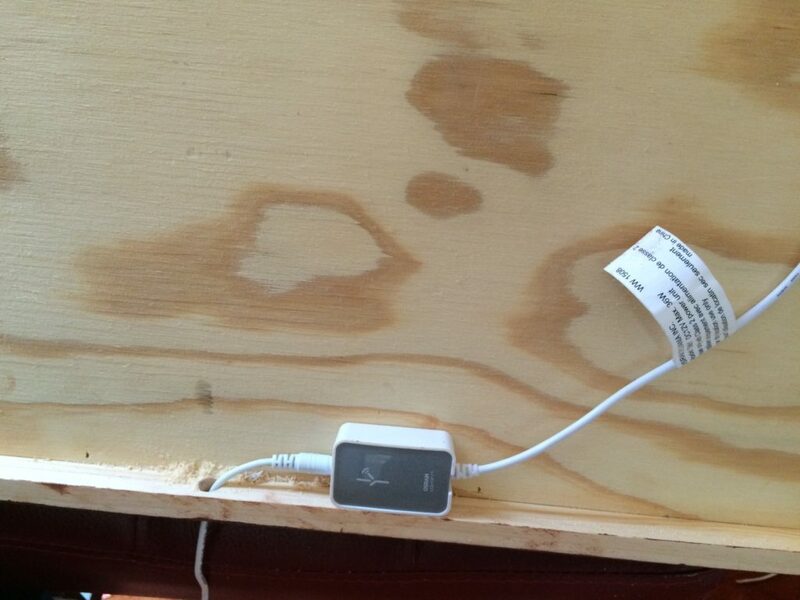 If you are doing this project then I highly recommend plugging in the lights before you add them to the frame…haha. If you do not, it would be awfully disappointing to go through the effort and the lights not work. Thank goodness that was not the case here so I was good to go. To install the frame I took the controller box and stuck it to the back near the bottom. I left enough room on the frame so that the controller box would be flush with the outside of the frame. I drilled a hole near the bottom of the frame for the plug wire to be passed through. To hang the frame I’m using a French cleat. If you’re interested in learning more about this method of easily hanging things on your walls in the shop or the house, check out my detailed tutorial found HERE for further details. I used a scrap board and cut a 45° angle on it then I attached it to the back of the frame. I then located the stud on the wall and attached another 45° cleat to the studs. So that’s it! I had a great time building this project and I hope that your are inspired to either replicate it to fit your particular space or possibly build one for a friend who would value a custom backlit LED sign. As I mentioned, this sign was built entirely out of scrap (not including the plexiglass and LEDs). 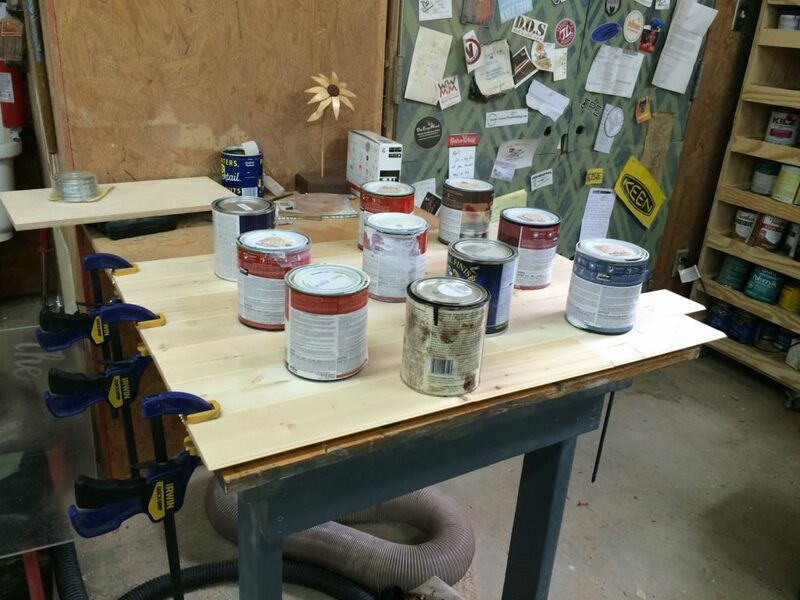 This is an ideal scrap wood project and has added a nice touch to the husbands man cave.